Room size: Irregularly shaped 9.5 x 9.5m open floor plan combines the living/listening room, kitchen and office. Added to this space the speakers see the air volume of the entry hall and a long corridor plus the 2nd-storey 6 x 9.5m loft. Wood-panel ceiling slopes up to the loft. Parquet flooring. Lots of non-parallel surfaces ('vertical gable' windows, twin-angle ceiling, spiral staircase enclosure, fireplace enclosure). For a pictorial tour see here. 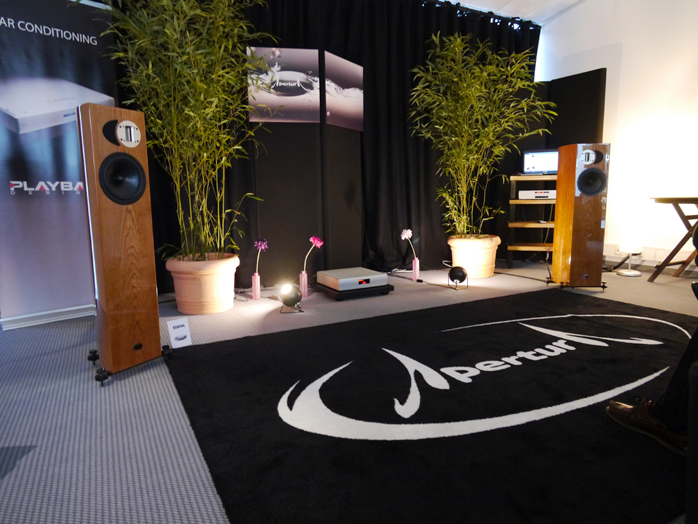 French speaker brand Apertura had been on my radar ever since Jefferson Torno delivered his €12'500/pr Grand Cru Audio Horizon speakers for review. That's because he and Apertura's Christian Yvon both use ribbon tweeters; favour two-ways; and exploit progressive crossovers. Yvon describes his as dual resonant intermodulation minimization aka DRIM filters. These multi-elliptic Cauer networks use independently adjustable ripple behaviour in both pass and stop bands. A triple transition slope begins at 6dB. Then it progresses to first 12dB then 24dB/octave steepness to net a stabilized rejection ratio of nearly minus 40dB. 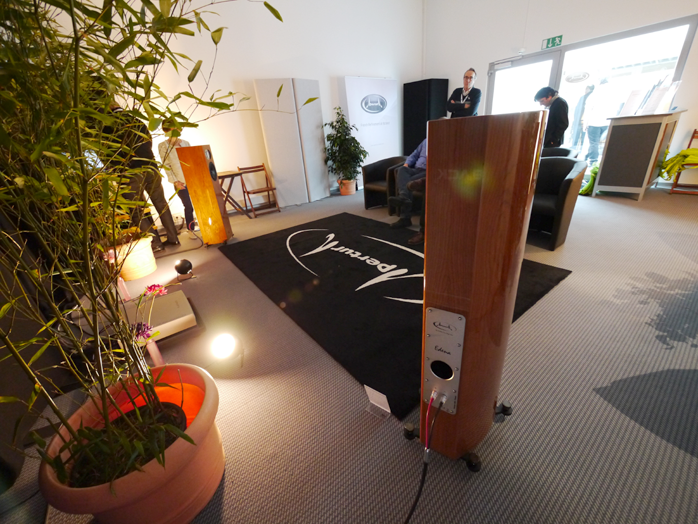 Prior to Apertura Yvon had co-designed with Georges Bernard the Goldmund Dialogue, Apologue and Epilogue speakers. His present third-from-the-top model on active display at the 2014 Munich show started at a sticker essentially half of the Horizon's whose sound I had admired. Hence I was keen to see what 'shared design DNA' might sound like from Yvon. München provided just that opportunity. After talking to general manager Eric Poyer about the most appropriate model given my new 100m² sound room, he pointed at their 8-inch two-way Edena playing, not their d'Appolito flagship. He called the Edena the model most tightly aligned with Christian Yvon's ideal design ethos. As I said in my show report, "...this was very good hifi sound with just the right degree of musicality to marry precision, transparency and capacious staging with satisfying tone and substance. 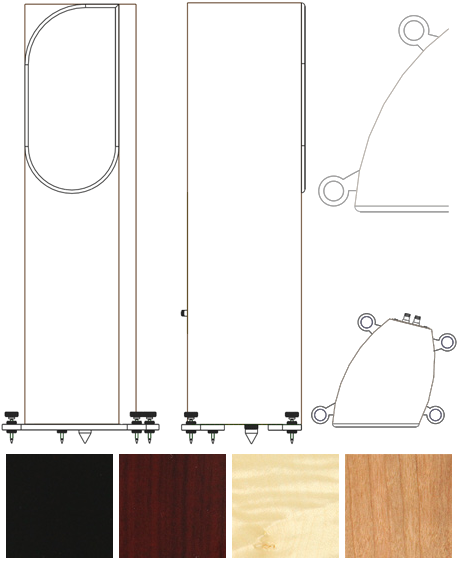 The unusual cabinet cross section with no parallel vertical panels and the finish quality were added highlights. As showgoers admitted about Sven Boenicke's little W5—on not needing more speaker based on its room-filling performance—this was another such reminder. The vast majority of folks with standard to good-sized rooms could call it a day with the Edena and leave the monkey coffin vanity speakers for those still enamoured by excess. And let's not kid ourselves: €6'500 for a pair of speakers is considered affordable only by wacky audiophile standards. Yet there we are. 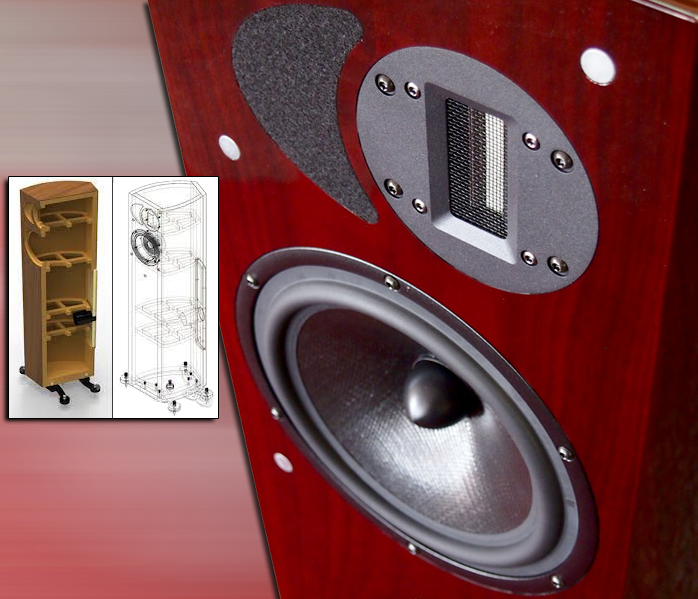 Give me this speaker over Magico's equivalent two-way tower any day of the week." In his post-show follow-up email, Eric reconfirmed mutual interest in the proposed review and offered the actual show sample because it was fully broken in; or a pair in another colour if I preferred. Being into white speakers these days I said so but also that since a preconditioned loaner was mandatory, I'd hesitate putting them through the additional trouble and would happily accept the show pair. Then I let go of personal finish preferences to wait on what would show up. On June 16th Eric confirmed that their Munich show pair had been inspected and repacked. It was ready for temporary importation to Switzerland. Whilst my exhibit photos show single-wire terminals and rear porting, they don't begin to telegraph how unusual the Edena's cross section is to avoid the dreaded parallel vertical panels. And though the asymmetrical plinth's four pointy footers appear to be the primary or sole support, there's actually a central fifth cone at the bottom. This is claimed to coincide with the cabinet's center of gravity. The four outer contact points are supposed to act as mere stabilizers, the hidden central one as the main anchor to provide a grounding path for vibrational energies like Goldmund's scheme of mechanical grounding. This notion also mirrors recent conventions at Triangle Electroacoustique. The drawings at right show the hidden cone as well as the cross section. The cheeks are of dissimilar length and curve outward, the front and rear baffles are overtly angled relative to one another to create toe-in if the back is set parallel to the front wall. The four standard finish colours are shown too. In the current iteration, the grill magnets are concealed beneath the veneer. The Edena combines a 4.8cm² 18mg light Neodymium-powered ribbon tweeter and 22cm composite polypropylene mid/woofer called isotactic matrix with 13cm Titanium-former voice coil. The cabinet uses high-density MDF from 25-44mm thick braced with four window-pane dividers. The filter network set at 2.8kHz employs Jantzen inductors and polypropylene capacitors on a board with 130 micron traces. The internal hookup wiring is Apertura's own. The grill is magnetically fixed at five points. Claimed bandwidth is 35-30'000Hz ±3dB, sensitivity 88dB. 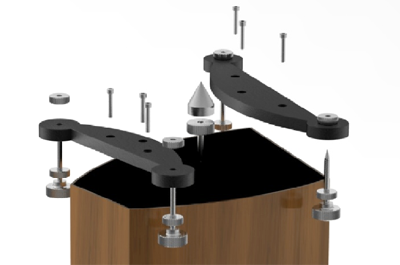 Nominal impedance is 8Ω, dimensions are 24.8 x 30 x 110cm WxDxH, weight is 33kg/ea.